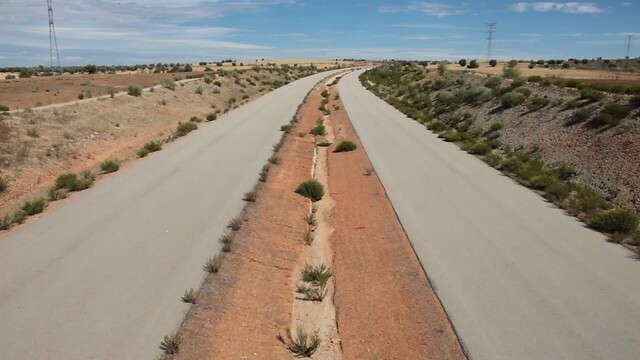 Two miles south-east of Mejorada del Campo – a small satellite town of Madrid – the semi-arid landscape of thorns and hardy bushes suddenly reveals the MP-203 highway: over a bridge to nowhere, the silent concrete dual carriageway curves northwards to the horizon. Standing on the bridge, I film the highway: how long before I will capture the powerful sense of emptiness, I wondered? A few seconds? A minute? Ten minutes? The wind picks up, shaking the small bushes that have gained a foothold in the central reservation below. 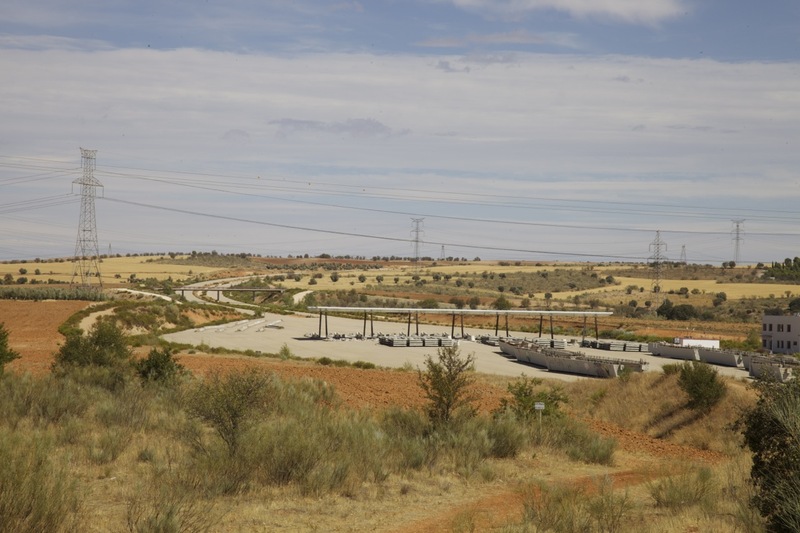 Intended as a relief road for the congested Madrid-Barcelona highway, this 12.5km stretch of highway was started in 2005 and 70 million Euros were ploughed into the project before construction work stopped abruptly in 2008. 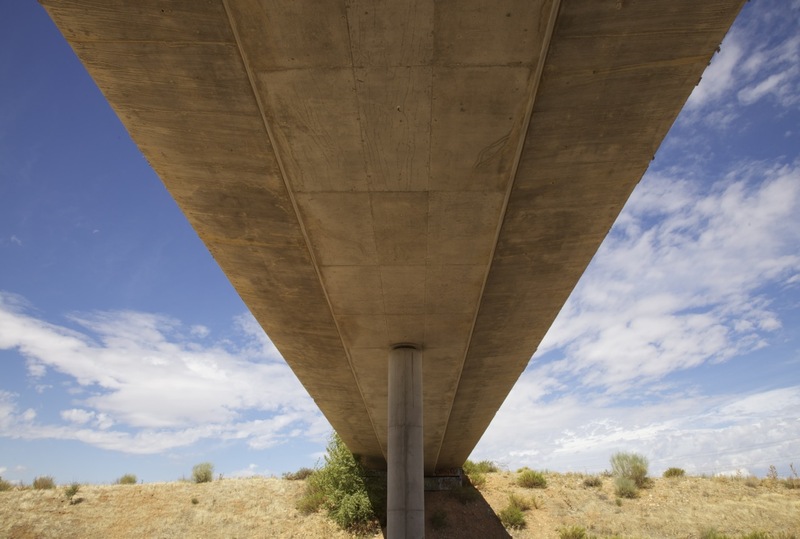 As it became clear that Spain would not be emerging from its deep recession any time soon, the highway project was shelved and has remained unfinished and abandoned for six years. In recent years, the Mail Online has published many articles on the numerous abandoned construction projects that now litter the Spanish landscape; the melancholy tone of these articles countered by a barely disguised schadenfreude at just how far the Spanish economy has sunk (well, compared to Britain anyway). In the Mail Online‘s estimation, the Spanish, it seems, always get ahead of themselves; their abandonments just desserts for their seemingly-intractable hubris. Perhaps one of the Mail Online‘s journalists should actually visit the abandoned highway; for it is an extraordinarily disconcerting site that raises questions about not only the future of all economies dominated by boom-and-bust capitalism, but also the place of the motorway in our imagination. For here is ruin at its most banal and also at its most brutal – the great swathe of concrete suddenly seeming like an alien entity that has simply appeared in the otherwise rural landscape. Without an endless stream of cars (which effectively removes the motorway as a ‘real’ space to be experienced), a road on this scale seems inhuman and out of time, as if both prehistoric and futuristic at the same time. 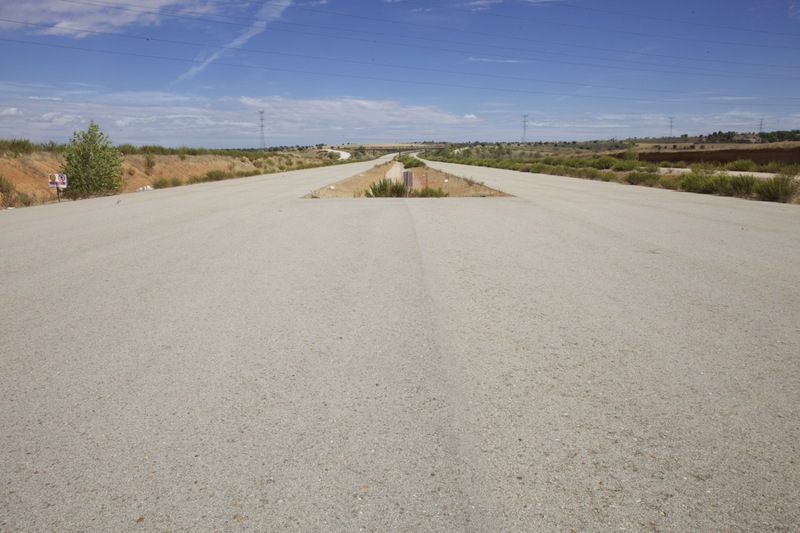 If walking on a deserted motorway is a popular trope in many a post-apocalyptic fantasy (such as the first episode of The Walking Dead), then actually doing it is to realise just how inhuman motorways are; to walk on one is to lose yourself in a desert of concrete, devoid of orientating landmarks. As I wondered about the effect of this ruin in reverse, I was led to think of J. G. Ballard’s own fantasia of the motorway, Concrete Island (1974). Charting the story of a lone male driver who crashes and becomes marooned on a patch of waste ground entirely enveloped by elevated motorways (based on the Westway in London), Ballard’s novel forensically documents an enforced experience of living in the fortress-like space created by the intersection of these monstrous roads, resulting in the Robinson Crusoe-like central character eventually accepting it as his home. As I left the surface of my concrete island (after barely an hour) and returned to the bustling streets of central Madrid, I realised that to truly embrace the motorway as a human space might require as radical a transformation as that seen in Ballard’s cautionary tale. Great stuff – a fairly unique experience to encounter. No destination, no arrival. Indeed – an interesting speculation is to imagine what motorways would become if cars suddenly become obsolete. Fascinating stuff. 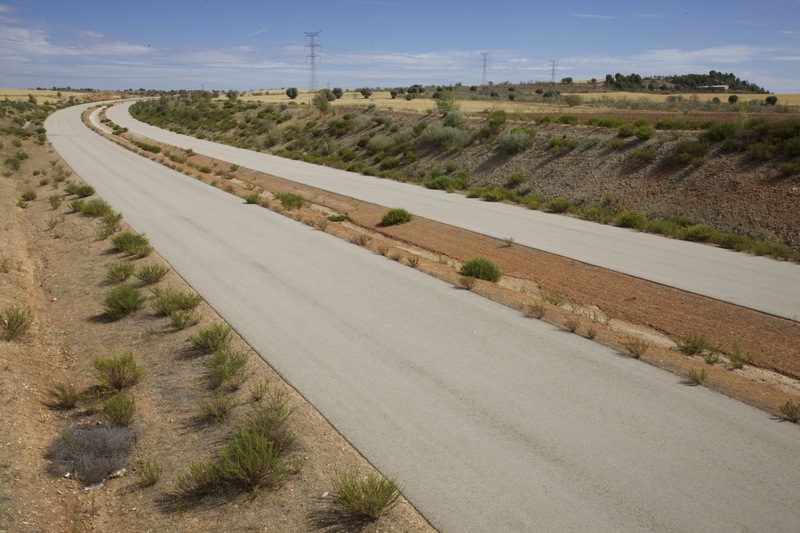 I did a cycling tour of Spain in 2000 and was surprised by the plethora of new highways that were being constructed at the time – roads that seem wholly unwarranted given the volume of traffic. A tell-tale symptom of boom-and-bust late capitalism no doubt. As ever, Ballard was prescient. Thoughtful points, Daily Mail bashing, JG Ballard, abandoned highway…how could I not enjoy this post! Thanks Alex! I’m pretty sure Top Gear did something here as well – a shame I didn’t give them a bit of stick.